The main difference between ASP and PHP is that the ASP or ASP.net is a web application framework created by Microsoft while the PHP is a server-side scripting language created by Ramus Lerdorf. 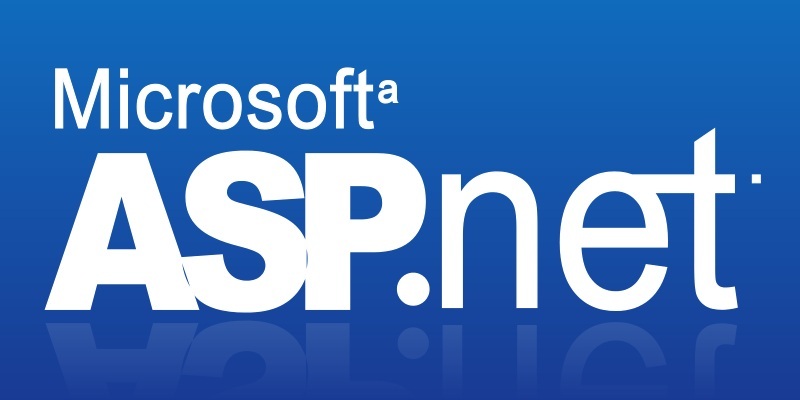 ASP.NET is a web framework developed by Microsoft to build websites, web applications, and web services. It is built on Common Language Runtime (CLR). It allows the programmers to develop scalable web application easily. On the other hand, PHP is an open source, interpreted language that can be executed at server side. It can be used to create dynamic web applications easily. There are three development styles for creating web applications. They are web forms, ASP.NET MVC and ASP.NET web pages. Firstly, web forms provide server-side controls and events to create web applications. Moreover, it provides powerful data accessing. Secondly, ASP.MVC allows building dynamic websites in an organized manner. The programmer can develop each of these components separately. Therefore, it increases the code maintainability. Model contains business logic while view contains user interfaces and controller handles the user interactions. Thirdly, ASP.NET web pages provide a fast and lightweight way of combining server code with HTML. The programmer can add video, link to social sites, etc. PHP is a server-side scripting language. PHP code has to be embedded with HTML code. PHP can perform various operations such as file handling, handling forms to collect data and sending emails. It also supports HTTP cookies for tracking purposes. Zend, Yii, Symfony, Code Igniter are some frameworks based on PHP. The programmers can use Integrated Development Environments (IDE) such as NetBeans, Zend Studio, and Eclipse to develop applications in PHP. PHP is commonly used to develop Content Management Systems (CMS) and e-commerce websites. Every web application is connected with a database to store data. 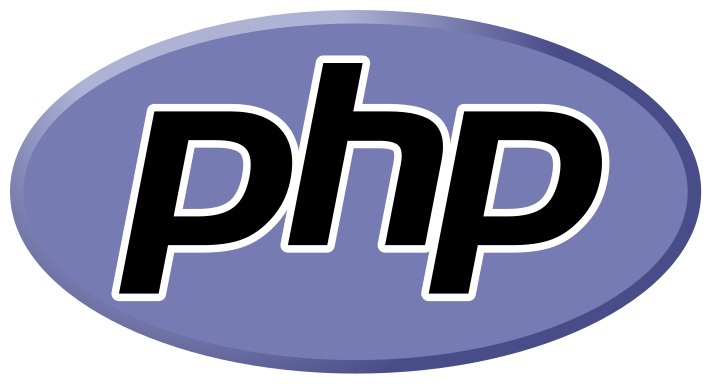 PHP can be easily integrated with databases such as MySQL. Joomla, WordPress, and Drupal are some CMSs based on PHP. Furthermore, it is cost effective to deploy and host the websites. It also provides better search engine rating and accessibility. ASP.NET is an open-source server-side web framework designed for web development to produce dynamic web pages. PHP is a server-side scripting language designed for web development but also used as a general-purpose programming language. Thus, this is the basic difference between ASP and PHP. ASP was developed by Microsoft. PHP was developed by Ramus Lerdorf. Whereas ASP stands for Active Server Pages, PHP stands for Hypertext Preprocessor. 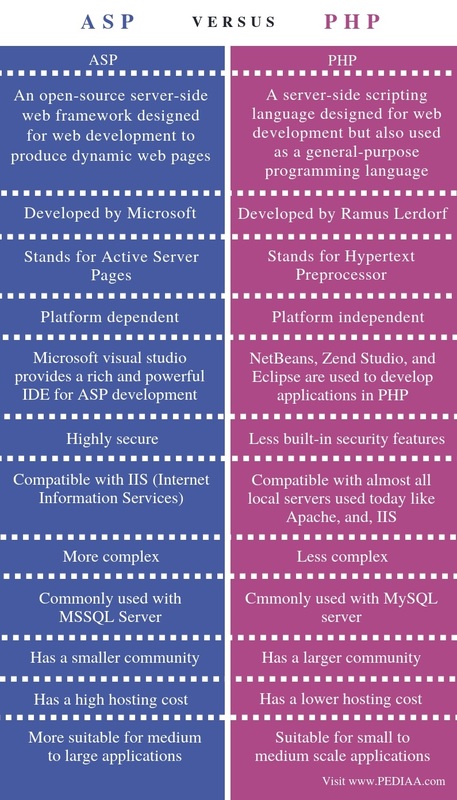 ASP or ASP.NET is platform dependent. It works in windows, but ASP-Apache has to be installed to use it in Linux. But, PHP is platform independent, so it works in Windows, Linux, Unix, etc. Therefore, this is a major difference between ASP and PHP. Furthermore, Microsoft visual studio provides a rich and powerful IDE for ASP development. NetBeans, Zend Studio, and Eclipse are used to develop applications in PHP. Also, while ASP or ASP.NET is highly secure, PHP has less built-in security features. Another difference between ASP and PHP is that the ASP or ASP.NET is faster than PHP. In addition, ASP or ASP.NET is compatible with IIS (Internet Information Services). PHP is compatible with almost all local servers used today like Apache, and, IIS. Moreover, ASP coding is more complex than PHP. This is another important difference between ASP and PHP. ASP or ASP.NET is commonly used with MSSQL Server while PHP is commonly used with MySQL server. Hosting cost is lesser in PHP than in ASP. PHP has a larger community than ASP. There is another difference between ASP and PHP based on their usage. ASP.NET is more suitable for medium to large applications while PHP is suitable for small to medium scale applications. Both ASP and PHP are useful to build web applications. The difference between ASP and PHP is that the ASP or ASP.net is a web application framework created by Microsoft while the PHP is a server-side scripting language created by Ramus Lerdorf. 1. “ASP.Net Introduction – Javatpoint.” Www.javatpoint.com, Available here. 2. “ASP.NET – Introduction.” Www.tutorialspoint.com, Tutorials Point, Available here. 3. “PHP Introduction.” Www.tutorialspoint.com, Tutorials Point, Available here.